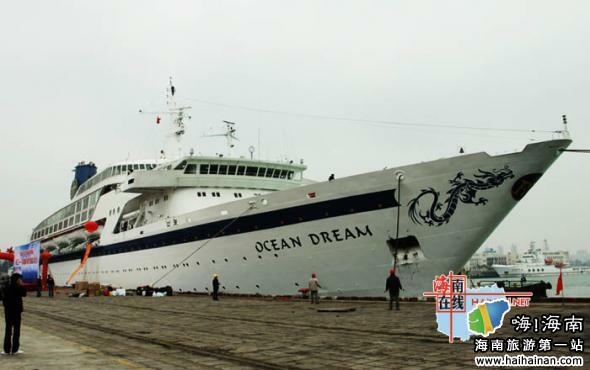 Haikou Xiuying Cruise Terminal welcomed nearly 500 visitors arriving on the cruise ship “Ocean Dream” at the cruise experience ceremony in Haikou in the afternoon of 9th January. The 500 visitors will be brought to Halong Bay, the best-known scenic spot in Vietnam. The cruise route, which mainly operates cruise tours from Haikou to Vietnam running once every 2 days, will cover 210 nautical miles, with nearly 15 hours on the sea. The highlight of the new cruise tour is that tourists don’t need to have a passport; a border pass certificate is accessible to Vietnam. At present, the policy is only applied in a few cities like Haikou and Beijing. The “Ocean Dream” is a professional cruise ship from Sierra Leone invested by Runfeng Ocean (Hong Kong) Deluxe Cruises Limited, with a gross tonnage of 20,000 tons, 9 layers in height, 163 metres in length and 22.8 metres in width. It’s a perfect cruise ship with thorough living, entertainment and dining facilities. 420 guest rooms are provided on the ship and 900 tourists are accepted for one sailing. In addition, Runfeng Ocean Deluxe Cruises Limited plans to purchase 2 – 3 cruise ships respectively steering from Haikou to Southeast Asia and from Sanya to Da Nang.